On this beautiful, sunny afternoon, I found myself staring out the window. Why is everyone gathered along the street below? 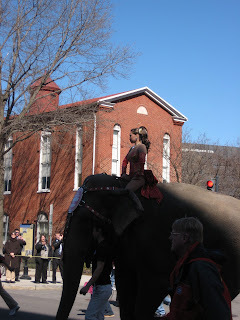 It's mid-March so it could only mean one thing-- the elephants are coming! Sure enough, with email, cell phones and Twitter, we soon learn that the circus has come to town and the elephant parade will once again pass by the corner of 3rd & G.
Something about seeing the elephants parade by against the backdrop of the red brick of the historic synagogue is just visually compelling. And it always brings a smile to my face. I even saw that most of the DC police officers lining the route were smiling. So many thanks to David McKenzie for taking this snap of the parade. Hope it makes you smile too. Yesterday the Society held the third of our series of salons, this one featuring sportswriter David Elfin. Twenty-seven people braved a rainy day to come to the home of our executive director, Laura Cohen Apelbaum. David has written for the Philadelphia Bulletin, Syracuse Post-Standard, Washington Post, and Washington Times, and served as president of Congregation Beth Chai. He regaled us with stories of his career in sports—including how he got Darrell Green, Art Monk, and Russ Grimm into the NFL Hall of Fame—recapped the Redskins’ 2009 season, and looked into the Burgundy and Gold’s future. After the lecture, everyone stayed around for a kosher tailgate meal. All in all, a great way to spend a Sunday afternoon. We still have plenty of other salons coming up, and we’d love to see you at a future event! Billed as 70 sessions in 7 hours on March 7, the massive "learn in" yesterday did not disappoint. I was honored to be asked to give an illustrated lecture on our exhibit and book, Jewish Life in Mr. Lincoln's City, at this annual event hosted by the Partnership for Jewish Life & Learning at the DC Convention Center. Several hundred "students" of all ages attended sessions on everything from tips on baking challah to notions on Jewish prayer. I was awed by the SRO (that's standing room only) attendance at our session. This was a terrific opportunity to teach about our community's history in a room of folks new to the Society and its programs. 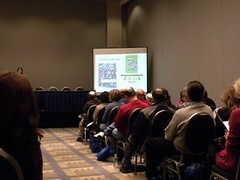 For another blogger's perspective on the event and more photographs, check out Rachel Mauro's JewishDC post.